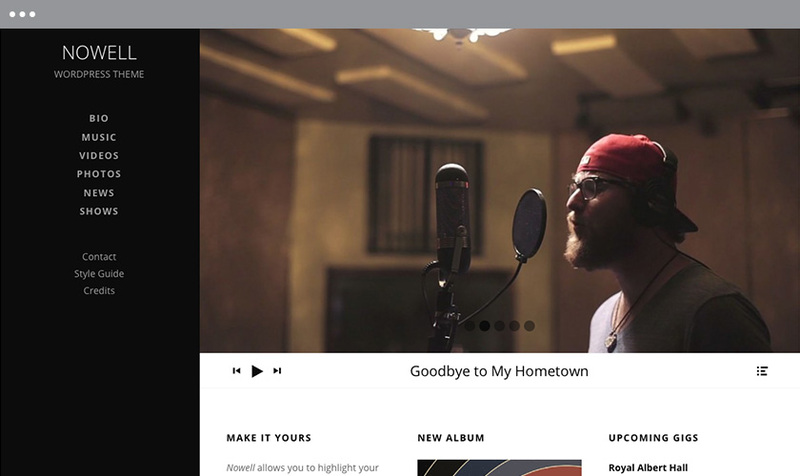 Nowell is a responsive premium WordPress music theme great for showcasing your media and making it the center of attention. Built on the AudioTheme framework, it has all the functionality a musician or band needs to maintain a professional web presence. Nowell’s focus is on clean simplicity while still offering a variety of customization options to create a unique online identity for your fans to interact and enjoy. Beautiful fonts make for a much better browsing and viewing experience. This is why with Nowell we’ve built in the ability to customize your theme with 30+ hand picked Google fonts. If you’re a Typekit customer, we’ve got you covered there too. Fully responsive with an off-screen sidebar on mobile devices. Videos and playlists that open in a lightbox. Full width responsive background image options. SEO friendly with integrated Rich Snippets and structured data for posts, pages, videos, gigs, records, and tracks. Insert custom media into the header of any page, with options for images, sliders, videos, custom links, and more. Apply fancy filters to your media page headers, including blur, sepia or grayscale. Highly configurable and utilizes the Theme Customizer so changes can be previewed instantly.